San Francisco circa 1930. 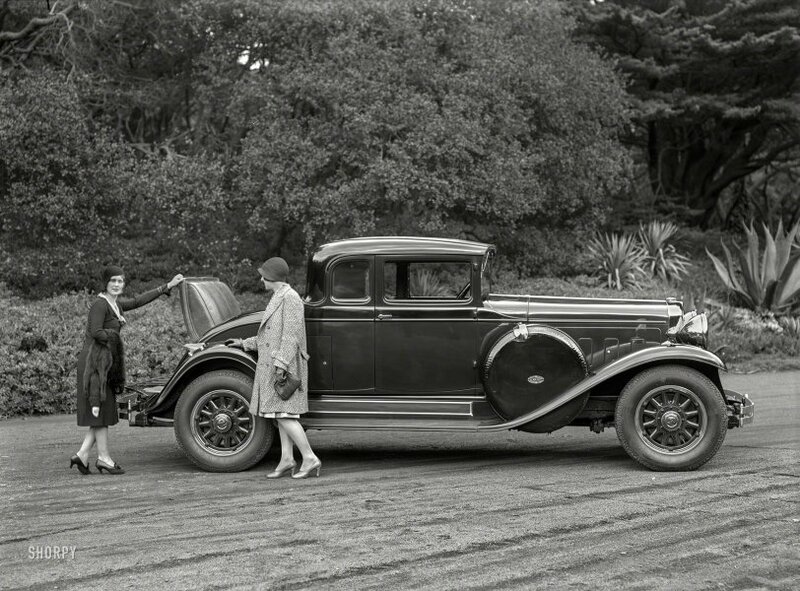 "Marmon Big Eight rumble seat coupe at Golden Gate Park." Today's entry in the Shorpy Baedeker of Brobdingnagian Buggies. 5x7 inch glass negative by Christopher Helin. View full size. Submitted by KathyRo on Sat, 02/09/2019 - 1:47pm. 'See - we can totally use this to dump the body." Submitted by missing link on Thu, 02/07/2019 - 4:34pm. How did someone, especially someone in a dress, get gracefully into a rumble seat? Submitted by Puddy1 on Thu, 02/07/2019 - 2:14pm. Just like Duesenberg and Stutz, Marmon was done in by the Depression. But prior to that they were making some of the finest cars in America. Brock Yates once wrote that the 1931 Marmon V-16 was one of the five greatest cars ever made. Submitted by switzarch on Thu, 02/07/2019 - 7:55am. Imagine that beautiful beast with a Viper V10 under the hood. A very handsome auto. It would make a super hot rod. Submitted by Bike Bubba on Wed, 02/06/2019 - 2:37pm. Look at those Firestones on that car--Harvey was ahead of his time in creating tires that would handle the ~145hp the straight 8 in that car would apply. Almost looks like a modern street rod.